Before citing a few highlights to stimulate your interest in reading the report, CCFJ’s Board of Directors wants to publicly thank all the participants for taking the time to respond and for their trust and frankness, regardless of the views they expressed. We also want to thank the volunteers who compiled and analyzed the data and reported the results based on that analysis. The most important finding of the report was that an unusually high percentage of the 450 respondents — 84.7% or better — favored the passage of all ten (10) proposed reforms. This result held up across all subgroups of respondents in every region as well as by gender, membership or non-membership in CCFJ and seven  distinctive traits of their communities. It also is substantially higher than the 75.1% minimum approval rating in our 2008 survey of the desirability for 14 reforms. 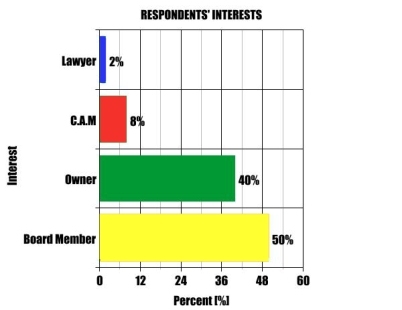 The bar graph below shows that 450 Floridians representing a wide range of interests (owners, board members, attorneys, community association managers and others) shared their views on the ten (10) suggested HOA reforms. This is the second survey to involve so broad a range of interests and to compare and contrast their disparate views in a statistically rigorous and objective manner. 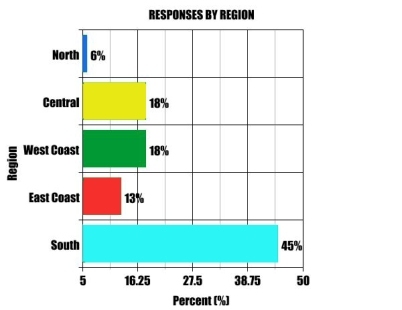 The bar graph below reveals that every region of the state was represented in the survey in rough proportion to its population of homeowners’ associations. On a personal note, our Board is pleased that the findings of the report validated so many of the concerns it had expressed over the years about earlier studies by other organizations. This survey raised the high standard established by our earlier 2008 survey and thus opens the way for more credible future surveys. This experience also reaffirms our belief that a joint effort by all interested parties and organizations (DBPR, the Florida legislature, CALL, CAN, etc.) would be a cost-effective way to obtain objective information to improve the lot of Florida residents in deed-restricted communities, minimize needless arguments as well as to measure and enhance the performance of the DBPR. We invite your comments, criticisms, questions and suggestions, with contact information please, so that we may respond as appropriate.